Price 18$USD per person per way Note: - We depart daily Bus from Hanoi to Cat Ba included bus - speedboat - bus. Pick up point at our office in Hanoi Old Quarter (#62 Hang Buom Str, Hoan Kiem, Hanoi) and drop off in Cat Ba Island. - Time pick up from Hanoi to Cat Ba around: 07:30am / 10:30am/ 14:00am - Duration : 3 - 3,5 hours. - Free Wifi, A bottle water & Snack on the bus. - Tour Guide during the trip. 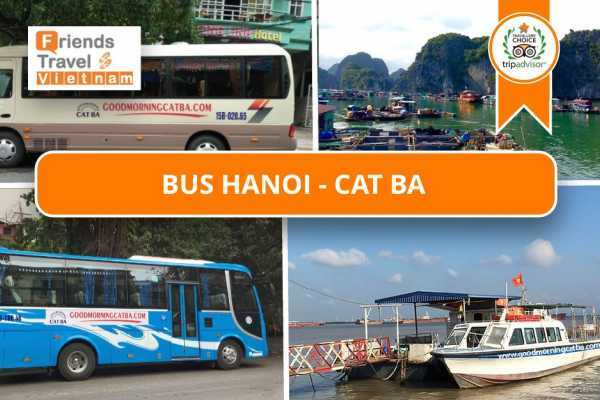 * TIMEABLE HANOI - CAT BA ISLAND DURATION Pick up Time Hanoi - Got Harbour Got - Phu Long Phu Long - Cat Ba TRANSPORTATION Open Bus Speed boat Open Bus TIME 2 Hours 15 Minutes 7 Minutes 45 Minutes DEPART - ARRIVE 7h30-8h00 8h00-10h15 10h20-10h30 10h40-11h15 DEPART - ARRIVE 10h30-11h30 11h30-13h30 13h30-13h40 13h40-14h30 DEPART - ARRIVE 14h00-14h30 14h30-16h45 17h00-17h10 17h15-18h00 We know our stuff over the years and we don’t mince our words. This journey to avoid the scam taxies, buses at the local bus station and unplanned extra costs on the way. Pick up from your hotel also included with non-road pick up on the way as local buses, plus with the speedboat, this combo will save your time than using local buses and a ferry with many inconvenience things. With our experienced and thoughtful drivers, you will be safe to discover Cat Ba Island with the unforgettable experience. Let’s go! FRIENDS TRAVEL VIETNAM’S LOUNGE WAITING AREA As the special privilege for our clients' Friends Travel Vietnam has his own private Lounge waiting area at our Office in Hanoi, just for your convenience to relax or to get refreshed. Free services: Drinks, shower service, internet, computer & print service, lounge coaches, storage room Extra Services: Laundry service. CHECK OUR LATEST PROMOTIONS & OFFERS: Last Minute Deals | Happy Birthday Discounts | Promotions Friends Travel Vietnam offer discounts for groups of 4 or more, we encourage groups to book with us by offering discounts for group bookings. For detailed information for bigger groups, prices and tickets, please contact us!